Greg Borrowman from Australian Hi-Fi recently spent some time with the 40th Anniversary Edition Neuphonix. Here’s what he had to say. Forty years ago, in a small shed out the back of a modest home in the suburbs of South Australia’s capital city, a young Scott Krix built the first pair of loudspeakers to carry the Krix logo using only hand-held power tools. This year, to celebrate his eponymously-named company’s 40th anniversary, Krix has designed and built forty very special pairs of loudspeakers in a state-of-the-art factory in those self-same suburbs… though this time he’s had the assistance of his brothers Gary and Ashley… indeed that of the entire Krix workforce, plus an array of state-of-the-art precision computer-controlled machines. I was a bit confused as to why Krix called these particular speakers ‘Neuphonix’ at all, because the company already has a line of speakers called Neuphonix (which will continue to be available, retailing for $3,995 per pair) and despite the similarity in names, the Neuphonix AE40 uses different drivers, and is slightly differently voiced from the Neuphonix. But the two are very obviously related, so ‘there’s method in’t’… as Polonius would have it. 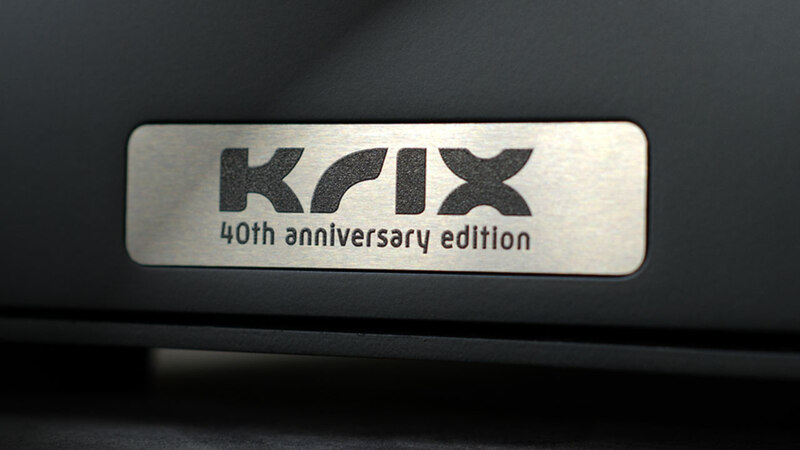 I am a bit grateful, however, that rather than succumbing to the temptation of calling these speakers the ‘Krix Neuphonix 40th Anniversary Limited Edition’ model (which is what they actually are!) the sensible and down-to-earth Krix family has instead rather modestly named them the Neuphonix AE40. 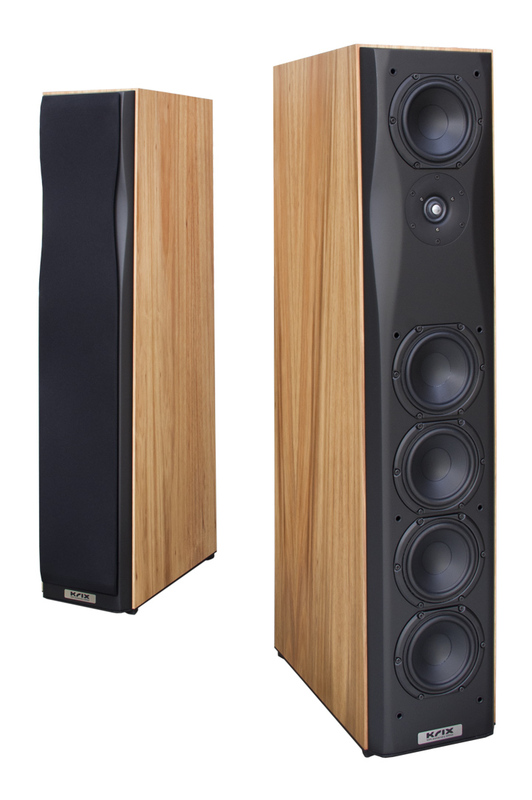 High frequencies on the Neuphonix AE40 speakers are delivered by Scan-Speak ‘Revelator’ tweeters, and their appearance on this model is a first for Krix, because this famous Danish-made tweeter hasn’t previously appeared on any Krix design. The Revelator 25mm ring dome diaphragm tweeter has a patented symmetrical drive neodymium motor system, a non-resonant aluminium rear chamber and a patented phase-plug design. The Neuphonix AE40’s midrange driver, on the other hand, has appeared on several previous Krix models and in fact is identical to the midrange driver used in the standard Neuphonix. It has a coated paper cone and a 26mm-diameter voice-coil on an alloy former and is mounted on a pressed steel frame. The magnet is 90mm in diameter and 28mm deep. As you may be able to see from the photograph accompanying this review, although the cone is a conventional circular shape, the chassis itself is oval-shaped, so it’s 133mm wide and 150mm long (with a mounting hole diameter of 142mm). The moving part of the cone is 117mm in diameter but the important dimension, the Thiele-Small diameter, is 116mm. The Thiele-Small diameter (named after Australian engineer Neville Thiele and US engineer Richard Small) is what’s used to give the effective surface area of the driver (Sd) which is what’s used to calculate the enclosure volume behind the driver that gives the best frequency response. In the case of the Neuphonix AE40, the enclosure behind the midrange driver is fully sealed, stuffed with acoustic wool, and has a sloping rear baffle so sound is less likely to reflect from the rear of the speaker, bounce off the rear wall and return to propagate through the cone. As for that imposing array of four identical bass drivers, although they look identical to the bass drivers used in standard Neuphonix, that’s only because they use the same cone: the underlying motor system (that is, the voice-coils and magnets) is completely different. And, although these drivers make their first appearance on a ‘Neuphonix’ design, Krix already uses these drivers (they’re fitted to the Epicentrix model). To ensure cohesive sound quality between these four bass drivers and the midrange driver, the bass driver cones are identical to that of the midrange. However the voice-coils, formers and magnets behind them are different… only the pressed steel basket is the same. However, because all four drivers operate together, we need to consider the total Sd of all four. Since a single driver has an Sd of 107cm², all four have a total Sd of 428cm². This means that if Krix had wanted to use a single driver to deliver the same cone area, it would have to have had a nominal diameter of 290mm… and since the cabinet is only 225mm wide, fitting a single driver with the same area would have been impossible! However, Krix didn’t use smaller-diameter bass drivers simply so they’d fit on the front baffle. Small driver cones have less mass than larger cones, so they’re easier to ‘start’ and ‘stop’ and also as a result have a more extended high-frequency response, making them easier to sonically ‘meld’ with a midrange driver (or a tweeter if no midrange driver is used, obviously not the case in this design). And, amazingly enough, four small drivers will deliver the same level of bass as a single driver with the same cone area. The only problem is that, despite their smaller size—and assuming equivalent manufacturing quality—four small bass drivers will always cost more than just a single bass driver… which increases manufacturing costs, and therefore final retail pricing. At first glance, the cabinet of the Neuphonix AE40 model looks similar to that of the standard Neuphonix and indeed it shares almost the same dimensions, being 225mm wide, 410mm deep and 1047mm high. However, there are subtle differences: the front baffle is angled to help time-align the drivers, and there’s a scallop either side of the tweeter to enhance dispersion and improve the head-on ‘visuals’. The crossover network, which splits the incoming audio signals three ways to make the Neuphonix AE40 a true three-way, six-driver design, is fixed to the inside base of the speaker and is enormous, extending the complete depth of the loudspeaker. This is partially to ensure that the magnetic fields of the six inductors it uses cannot interact with each other, but also because of the number of components that have to be accommodated on it: 25 in total including a brace of very large MKP Krix-branded capacitors, all hard-wired and hand-soldered. At the rear of the Neuphonix AE40 is one of the largest bass reflex ports I have ever seen. It has an effective diameter of 106mm and is 82mm in length. And below this port is one of the most beautiful speaker terminal plates I’ve ever seen. It has three pairs of (+)/(–) binding posts, so you can tri-wire the AE40s if you like, or use an external electronic amplifier and tri-amplify them. (Or bi-amp, or bi-wire… or pretty much operate them whichever way you think best.) The terminals are extremely high-quality and connected via a solid brass busbar. All three pairs are fitted to a highly polished stainless steel plate that gives technical information and also shows which of the 40 pairs in the series it is. Not surprisingly, the Neuphonix AE40 has been on the drawing board for a long time. In the beginning, Krix planned to release it in only a single finish, a ruby-coloured real wood veneer made from the Australian red gum tree, on the basis that the gem most-often used to celebrate 40th anniversaries is the Ruby. However, just before the AE40 went into production, the company had a change of heart (so to speak!) and Krix now offers this model in four finishes: Blackwood, Spotted Gum, Red Gum and Black Ash. The pair loaned to us for this review was finished in Blackwood. Although this review pair was numbered ‘1 of 40’ (it being the first of a ‘Limited Edition’ run) they were actually the ‘Reference’ version used for production and also the exact same speakers that were demonstrated in Krix’s room at the Australian Audio and AV Show at the Rialto Hotel in Melbourne (so if you saw these speakers looking a bit damaged in Krix’s room at the show, it’s all true… the small dents in the cabinet and front baffle were down to us.) Because of this ‘review speaker/demo speaker’ history, Gary Krix, told us that the ‘1 of 40’ badge would be removed from this particular pair and instead affixed to a freshly minted pair hot off the production line (and thus totally unblemished and completely unused). About which more later because I spent an awfully long time auditioning the Neuphonix AE40s using just the one album—one that’s more notable for (other than the music on it) its midrange. That album is Damien Rice’s ‘O’, which I seem to have been the last person in the world to discover. Indeed I’d never heard of Rice until I saw the movie ‘Closer’ (directed by Mike Nichols and starring Julia Roberts, Jude Law, Natalie Portman and Clive Owen.) I liked the movie, but absolutely loved the soundtrack, particularly The Blower’s Daughter, so I sat through the interminable credits to discover who played it. ‘O’ is a completely mesmerising album… so captivating that if it were on vinyl, I would have worn it out already. As for that bass balance I mentioned earlier, I found the AE40’s balance was spot-on when the speakers were positioned two metres or more from rear walls: exactly right. However, as I moved the speakers closer to the wall behind them, the level of low bass gradually and slightly increased. So do experiment with positioning. High-frequency performance was exceptionally good. In the wrong designer’s hands, the Revelator tweeter can be a bit ‘spitty’, but in the Neuphonix AE40 it sounds silky-smooth, super-airy and ultra-extended. The ‘air’ in the acoustic of live recordings is presented so palpably it’s as if you’re in the room and the harmonics of high-frequency instruments are rendered exactly: pitched perfectly and at precise levels. But wait, it gets better… because the physical size of the Neuphonix AE40s, and the quasi ‘line-array’ of the bass drivers, when combined with the linearity and extension of these speakers means the presentation of the soundstage is big… really BIG… and surroundingly so! Sit in the sweet spot, close your eyes and you’ll be transported to wherever what you’re listening to took place, whether it’s a smoky New York jazz club, the Sydney Opera House, or a huge outdoor arena. It just doesn’t get better than this. With only forty pairs on offer I’d recommend being quick, because my bet is that the first forty people to hear the Neuphonix AE40s will snap them up simply for their sound quality: they sound that good. At least I hope they do it for that reason. I don’t like the idea that someone would buy them just so they could own a piece of hi-fi history, or because these models could become collectable.